Thanks for shopping with us at Caribbean Cool Wear. We appreciate your business and we want you to enjoy our shirts as much as we do. They're a lot of fun to wear. Once you try them, we know you will love them too. When you put on your shirt, it transports you to another time and place. You can almost feel the island breezes and taste the margaritas! We import our great tropical shirts from the Rima Beachworld store on the beautiful island of St. Maarten, N.A., in the eastern Caribbean. What a wonderful, friendly island! Whether you are stocking up for your next cruise or vacation, or you just want a few nice shirts for Hawaiian Shirt Day on Friday, our store is the place to go for the coolest shirts around. They're easy to care for, never shrink, fade, or wrinkle, and they really look great. Try a few and you'll understand why everyone loves them. We have sizes to fit everyone, from small to 3X. Our shirts are generously cut and loose fitting. You'll love the look and so will everyone who sees your shirts. There is simply no other product out there that matches the quality and comfort of an authentic Rima Beachworld shirt. Our shirts are made from terivoile (pronounced "terry foil") which is a special weave of 100% polyester that looks and feels just like silk, but without the hassles of caring for silk. Sometimes people think that polyester will be too hot because of their past experiences with other garments made of polyester. But that's another big difference with terivoile. This unique weave makes these shirts breathe, which keeps you cool in even the hottest weather. Remember, people wear these shirts all over St. Maarten, which is a tropical island. Company co-owner, Jeff, wears his shirts year round in sunny central Florida and always feels cool and comfortable. You will be amazed at how light and comfortable these shirts are and how nicely they hang. Why just be cool when you can be Caribbean Cool? These shirts are hot! We will work hard for your business and your satisfaction is our number one concern. Again, we thank you for shopping with us. Some of our customers have asked about "the shirt lady," the woman you've see at our booth at fairs and festivals. Company co-owner, Angela, is an attorney and a real estate broker, now retired from both. She is a private pilot with an instrument rating and flies a Cessna 182. Flying is her passion and husband and co-owner, Jeff, is her most enthusiastic passenger, particularly if golf and/or a good meal is waiting at their destination. No story "about us" would be complete without mentioning our support staff, Peanut & Lola, both of who diligently toil away in our office as we work. 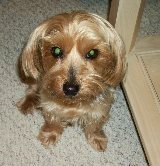 Update: We are sad to report that Peanut crossed the Rainbow Bridge on Sunday, March 7, 2010. Because her support was a big part of getting this business going, Peanut will remain on this page and in our hearts forever. We thank all of our pet-loving friends for their kind words on our loss. Update: We are thrilled to announce that Jezebel joined our staff in January 2012, after being found alone and shivering on a dark and rainy morning outside an isolated office building. Jezebel has taught us all so much about happiness and gratitude for the simple things in life. She and Lola have become best buddies! Update: We are exceptionally sad to report that company co-owner Jeff passed away the morning of August 4th, 2016, after a long and arduous fight against the complications of diabetes. This last year had been a particularly difficult one for him and he is finally at peace after losing his incredible battle. He was a wonderful husband and an even more wonderful father and brother. He will be missed by everyone in the family. Update: We are sad to report that Lola has joined Peanut across the Rainbow Bridge on Monday, October 3, 2016. Lola had many health challenges over the years but this last one was just too much. It is a blessing to have had her in our lives for as long as we did. It is also a blessing to know she is free of pain. Thank you once again to our customers for all of your kind words. Lola was 14 years old. Update: We are extremely sad to report that company founder and co-owner Angela passed away unexpectely on November 19, 2018. Angela's sister Marguerite is committed to keeping Caribbean Cool Wear going in honor of her sister, as Angela truly enjoyed finding beautiful shirts for her customers.